The Funky Felter: If you love all things felt and felted, then check out CraftGossip.com's Felting Blog with Editor Linda Lanese! 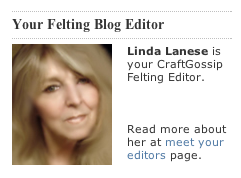 If you love all things felt and felted, then check out CraftGossip.com's Felting Blog with Editor Linda Lanese! So do you crave all things felt? If you'd like to know the latest and greatest about traditional felting, woven felts, and even basic cut-and-sew craft felt, then you have to go explore Craft Gossip's Felting Blog. The editor, Linda Lanese, covers every topic related to felt imaginable from books & supplies to the best new and seasoned feltmakers and fiber artists. It is a great read and very inspiring. She's even been so kind to feature me twice which I'm honored and thankful for. And, if you have a passion for other crafty topics such and jewelry making, bath and body, scrapbooking, etc., etc., etc., you can find a category blog for it on Craft Gossip. It is a very diverse and interesting site all-around. Go check it out! I'm sure that you'll want to bookmark it and visit often! **The image is a screen shot from Craft Gossip's Felting Blog main page.